A complete overhaul of Disney Cruise Lines' veteran Disney Magic vessel will feature new characters, children's clubs and water slides. Beginning in September after its summer season in the Mediterranean, the ship of 15 years will enter dry dock in Cadiz, Spain. For the first time, Marvel cartoon characters will be incorporated in the revamped Avengers Academy entertainment area, where children aged from three to 12 can interact with their favourite Marvel legends. 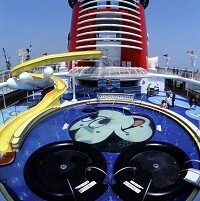 Extending 20 feet over the edge of the vessel, a clear tube will form part of the three-storey-high AquaDunk body slide. Another water slide is 250-feet long and features turns and loops. Replacing the Parrot Cay restaurant will be a new Brazilian-style Carioca restaurant. Also, the Topsider Buffet will be given more space and be renamed Cabanas, which will feature an Australian-themed menu. Families wanting to share with their children an experience at sea should examine the options of cruise travel insurance. "We have always been committed to reinvesting in our fleet and continuously making shipboard enhancements that elevate the guest experience," Disney Cruise Line president Karl Holz said, adding: "What we're doing with the Disney Magic is yet another step forward in our commitment to delivering the absolute best family vacations at sea."